The Zsolnay factory was established in Pécs, Hungary in 1853 by Miklós Zsolnay with his son Ignác as a small business producing stoneware and earthenware. A decade later Vilmos Zsolnay, also a son of Miklós, began to manage and grow the family's ceramic art business. His work led to recognition at the 1873 World Exhibition in Vienna, which resulted in numerous orders for the company's wares from England, France, Russia, and even the United States, according to www.zsolnay.com. Zsolnay's ceramic arts continued to receive accolades at exhibitions around the globe, including a gold medal at the 1878 World Exhibition in Paris, France. For the millennium celebration of the Hungarian Kingdom, the factory introduced what many consider to be its most beautiful pieces which incorporated its exclusive Eosin glazing technique (see example at right and read more below). In honor of his decorative arts achievements, the Hungarian emperor awarded the Franz Joseph Order to Vilmos Zsolnay, and the city of Pécs gave him the title of Honorary Town Citizen. 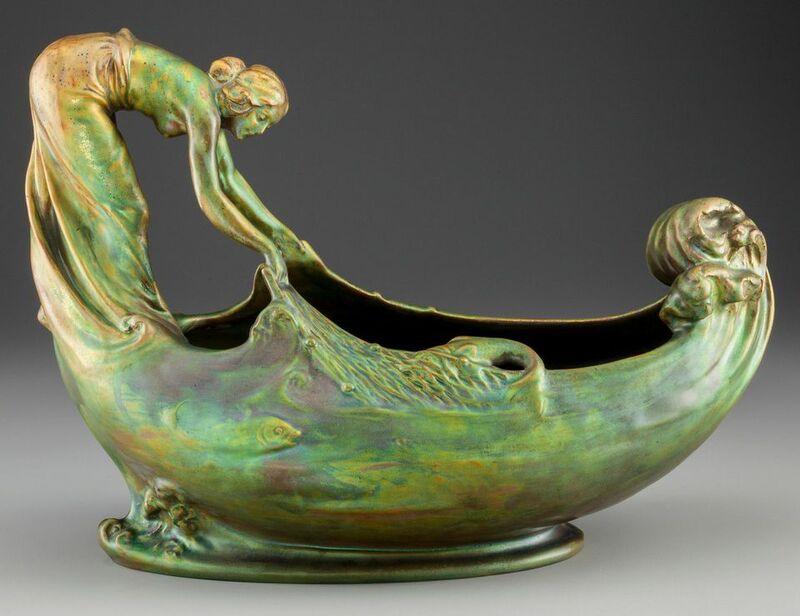 After Vilmos Zsolnay's death in 1900, Miklós continued to run the family's world-renowned factory embracing the Art Nouveau influence prevailing in decorative arts at that time. The factory also established a reputation for producing beautiful weather-resistant architectural tiles. Over the next few decades, the business went on to survive a number of challenges including two world wars, difficulties in obtaining materials for production, and changes in international politics. In fact, during communist rule in Hungary, the Zsolnay plant was renamed the Pécs Porcelain Factory and became part of a state conglomerate turning out industrial products, according to information shared on Collectics.com. From the 1950s onward, as the political and cultural atmosphere in Hungary became more open, the Zsolnay factory permitted new designers to produce work that explored modern abstraction. In the 1970s and '80s, guest artists like Victor Vasarely and Eva Zeisel conceived beautiful pieces that revived earlier organic shapes and metallic glazes, according to the Zsolnay website. The company's production of vividly-colored tiles and architectural ornamentation, examples of which still decorate structures throughout Hungary, were also reintroduced at this time. Vilmos Zsolnay, an innovator in the pottery industry during the late 1800s, developed a number of techniques unique to his company's wares. One of his most noteworthy achievements yielded Eosin glaze, first used in 1893. This iridescent glaze imparts the beautiful decorative qualities of painted porcelain but allows a much richer use of color consistent with pottery manufacture. Zsolnay pottery decorated with Eosin glaze has been mistaken for glass, like iridescent pieces made by Tiffany and Steuben, or even metal, at first glance. Products are still being made at the Zsolnay factory using this exclusive technique, and its luster has inspired collections of both old and new pieces worldwide. The earliest pieces of Zsolnay pottery were not marked, according to the Hungarian Heritage Museum. By 1878, however, pieces leaving the Zsolnay factory were marked with a tower trademark showing five towers for the five medieval churches in Pécs along with the words "Zsolnay" and "Pécs." Most Zsolnay is also marked with a series of incised numbers corresponding to a form book design, which relates to a production date. Form number 782, for example, indicates production between 1873 and 1882. This makes dating older pottery made by this company fairly easy once you know the code. A list of Zsolnay production numbers with related dates can be found on The Zsolnay Store's website. Collectics.com reports that the factory is still under state ownership for the most part, but its art pottery studio continues to create original designs along with new editions of many of the 30,000 items produced there since 1853. This includes an array of objects featuring the iridescent Eosin glaze along with architectural elements often incorporated into contemporary buildings in the area.